Jim Wadkins (fmc) on Jordans Plant. Jane McNele (fw) complains that you have her children and will not give them up. You will deliver them to her when she applies or sends for them and have nothing further to do with them. Should you refuse to obey this order I shall send the sheriff to arrest you and you will have to pay the costs. 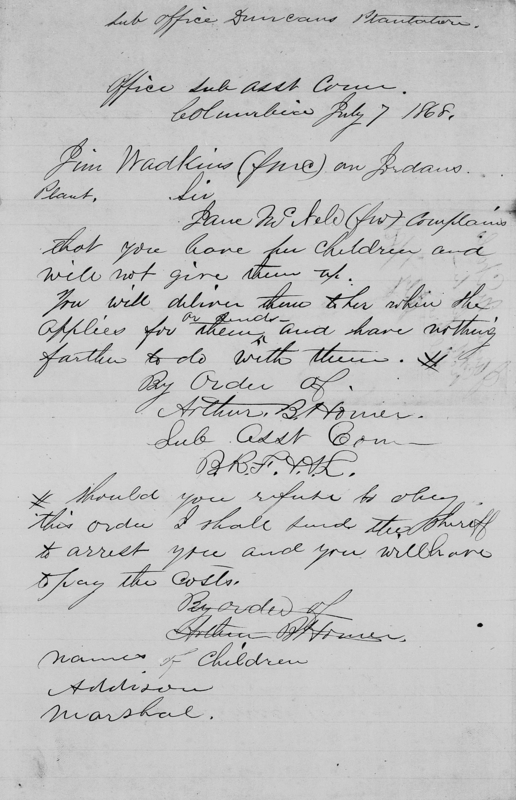 “Texas, Freedmen’s Bureau Field Office Records, 1865-1870,” images, FamilySearch (https://familysearch.org/pal:/MM9.3.1/TH-1971-27424-23535-48?cc=1989155&wc=94K7-MNY:266079201,266093301 : accessed 30 December 2014), Columbia > Roll 16, Miscellaneous records, Oct 1865-July 1868 > image 134 of 223; citing NARA microfilm publication M1912, National Archives and Records Administration, Washington, D.C.